When talking so much about Vulgar Comedy I must define my view on the opposite, the Official Theatre, as well. It will be extremely shortened and generalized, since the amount and variations in genres are almost as great is in Vulgar Comedy and there are lots of minglings and confusions. When I speak about the Official Theatre I mean the sanctioned theatre, whether sanctioned by governments, equities and guilds or by commercial interests. It is those theatres whose basic political agenda is status quo. This form of theatre separated and became sanctioned by the rulers at a very early stage (See HERE). 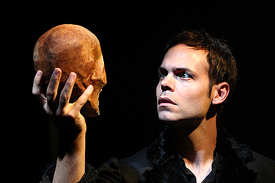 It continued developing through the Dionysia ta en Astei, Moralities and Miracle plays, Commedia Erudita, the French Classicism, the commercial Boulevard theatres up till todays National theatres and private Broadway theatres. 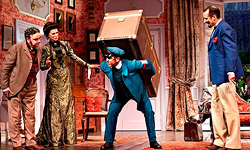 The Official theatre emphasizes mostly on psychology, intellectualism, honor and authorized values instead of direct communication, celebrating, laughing and political satire. It has a need to be in control. A lot of the Official Theatre has an educative approach where it seeks to raise virtuous, toilful and obedient citizens. In many ways one can say that the audiences are there for the ensemble and not the opposite. As evidence we can remind us of how actors in a Bergman play at the royal Dramatic theatre in Stockholm broke the show to complain about how the audience were coughing and in that way disturbed the actors concentration or how people in the audience can come out from a show thinking they are stupid since they didn’t understand it when it really is the actors that were not able to communicate. The comedies in the Official Theatre are more based on humor than laughter since laughter is not able to be controlled on the same way. I have included the big commercial theatres that started out in the early nineteenth century, even though that are a lot closer to Vulgar Comedy, but they differ in resources and goals for its activities. 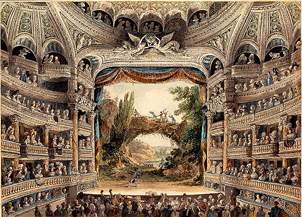 The goal for the commercial theatres is not to educate people or spread its values as other Official Theatre; it is simply to make money, therefore it is free from morals and long-term planning. Its main concern is to win the audiences favor by any means. This entry was posted in 2 Vulgar Comedy and tagged blog, blogg, buffoon, comedy, commedia, Commedia dell arte, commercial theatre, dramaten, educational theatre, humor, Klingvall, Kompani Komedi, laughter, Micke Klingvall, official theatre, physical theatre, royal theatre, scandinavian theatre, theatre, theatre education, vulgar, vulgar comedy. Bookmark the permalink.